Here in NYC, if you want skyline views, you’re going to have to cough up some serious dough. 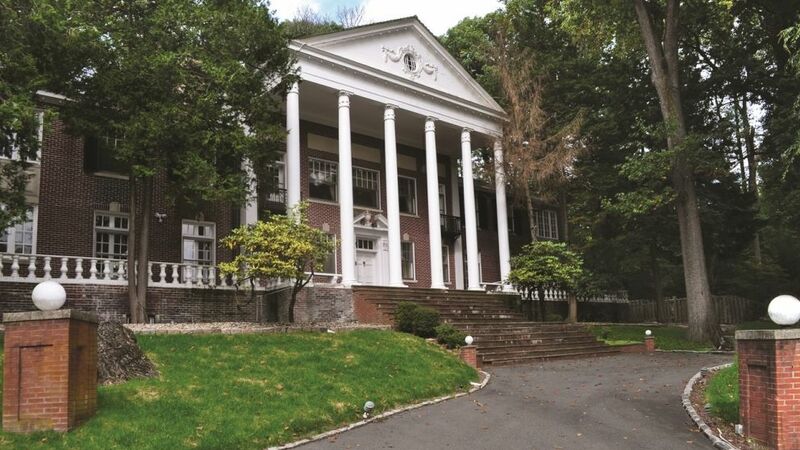 But just 45 minutes away, in South Orange, New Jersey, you can get that, plus an entire historic mansion sitting on more than two acres, for less than $600,000 (h/t CIRCA). That is if the bidding doesn’t get too out of control. This 11,000-square-foot Georgian-style home is headed to auction on November 18th and the minimum bid is set at $575,000. The winner will be living in Gilded Age glamour, as the 1924 home retains five ornate fireplaces, coffered ceilings, marble Corinthian columns, and an entire ballroom. According to the listing, this “stately residence” was “designed in the style of the Gilded Age mansions of Newport.” It has five bedrooms, four full bathrooms, and two half baths. Surrounding the home are over two acres of “English-style” gardens complete with walking paths, a tiered stone patio, and an in-ground pool. It doesn’t specify that any of the period furnishings come with the home, but clearly, the previous owners paid attention to its historic integrity. The ballroom boasts an ornate, wooden coffered ceiling and wood-paneled walls. The other architectural highlight is the grand foyer, with its intricately painted ceilings, stately columns, and double staircase. The home is just a 45-minute drive to NYC and is close to NJ Transit. It’s also near hiking at the South Mountain Reservation, the Turtle Back Zoo, and several golf courses and country clubs.